For other uses, see Zaporizhia (disambiguation). 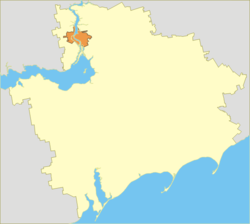 Zaporizhia Oblast (yellow) with the City of Zaporizhia (orange). Zaporizhia (Ukrainian: Запорі́жжя [zɑpoˈriʒʒɑ] Zaporizhzhya), also known as Zaporozhye (Russian: Запоро́жье [zəpɐˈroʐjɪ]), formerly Alexandrovsk (Russian: Алекса́ндровск [ɐlʲɪˈksandrəfsk]; Ukrainian: Олександрівськ [ɔlɛksɑndriu̯sʲk]), is a city in southeastern Ukraine, situated on the banks of the Dnieper River. It is the administrative centre of the Zaporizhia Oblast (region). The city population is the sixth largest in Ukraine. Zaporizhia is known for its island of Khortytsia and Dnieper Hydroelectric Station. It is also important industrial centre producing steel, aluminium, aircraft engines, automobiles, transformers for substations, and other heavy industry goods. Until 1921 the city bore the name of Aleksandrovsk after the name of a fortress that was a part of the Dnieper Defence Line of Russian Empire. In 1921 the city name was changed to Zaporizhia (Zaporozhye). The city's name "Zaporizhia" literally means the position of the city located beyond the rapids (later, in 1932 the rapids were flooded in order to build the Dnieper Hydroelectric Station). Archaeological finds show that about two or three thousand years ago Scythians lived around a modern city. Later, Khazars, Pechenegs, Kuman, Tatars and Slavs dwelt there. The trade route from the Varangians to the Greeks passed through the island of Khortytsia. These territories were called the "Wild Fields", because they were not under the control of any state (it was the land between the highly eroded borders of the Polish-Lithuanian Commonwealth, the Grand Duchy of Moscow, and the Ottoman Empire. In 1552 Dmytro Vyshnevetsky erected wood-earth fortifications on the small island Little Khortytsia which is near the western shore of Khortytsia island. The scientists consider these fortifications to be a prototype for the Zaporizhian Sich — the stronghold of the paramilitary peasant regiments of Cossacks. View of Alexandrovsk at the end of the 19th century. 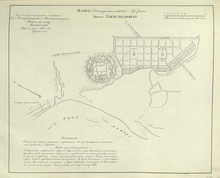 In 1770 the fortress of Aleksandrovskaya (Александровская) was erected and is considered to be the year of the foundation of Zaporizhia. As a part of the Dnieper Defence Line the fortress protected the southern territories of Russian Empire from Crimean Tatar invasions. It is uncertain in whose honour the fortress was named. Some believe that it was Aleksander Golitsyn, the general who served Catherine the Great. Other possibilities are Prince Aleksandr Vyazemskiy or Alexander Rumyantsev. In 1775, Russia and the Ottoman Empire signed the Küçük Kaynarca peace treaty, according to which the southern lands of the Russian Plain and Crimean peninsula became Russian-governed territories. As a result, the Aleksandrovskaya Fortress lost its military significance and converted into a small provincial rural town, known from 1806 under the name Alexandrovsk (Александровск). In 1789, Mennonites from Danzig (Prussia) accepted the invitation from Catherine the Great to settle several colonies in the area of the modern city. The island of Khortitza was gifted to them for "perpetual possession" by the Russian government. In 1914, the Mennonites sold the island back to the city. The Mennonites built mills and agricultural factories in Alexandrovsk. During the Russian Revolution and especially by World War II most of the Mennonites had fled to North and South America as well as being forcfully relocated to eastern Russia. At present, few Mennonites live in Zaporizhia, although in the area many industrial buildings and houses built by Mennonites are preserved. In 1829, it was proposed to build a cable ferry across the Dnieper. The ferry could carry a dozen carts. The project was approved by Tsar and later was used in other parts of the Russian Empire. In 1904 the ferry was replaced by the Kichkas Bridge, which was built in the narrowest part of the river called "Wolf Throat", near to the northern part of the Khortytsia Island. The first railway bridge over the Dnieper was the Kichkas (Кичкасский) Bridge, which was designed by Y.D. Proskuryakov and E. O. Paton. The construction works were supervised by F. W. Lat. The total bridge length was 336 meters. It crossed the river with a single span of 190 m. The upper tier carried a double-track railway line, whilst the lower tier was used for other types of vehicles; both sides of the bridge were assigned as footpaths. It was built at the narrowest part of the Dnieper river known as Wolf Throat. Construction started in 1900, and it opened for pedestrian traffic in 1902. The official opening of the bridge was 17 April 1904, though railway traffic on the bridge only commenced on 22 January 1908. The opening of the Kichkas Bridge led to the industrial growth of Alexandrovsk. In 1916, during the World War I, the aviation engines plant of DEKA Stock Association (today better known as the Motor Sich) was transferred from Saint Petersburg. The Kichkas Bridge was of strategic importance during the Russian Civil War, and carried troops, ammunition, the wounded and medical supplies. Because of this bridge, Alexandrovsk and its environs was the scene of fierce fighting from 1918 to 1921 between the Red Army and the White armies of Denikin and Wrangel, Petliura and German-Austrian troops, and after their defeat, the struggle with insurgents led by Grigoriev and Makhno. The bridge was damaged a number of times. The most serious damage was inflicted by Makhno's troops when they retreated from Alexandrovsk in 1920 and blew a 40 m wide gap in the middle of the bridge. People's Commissar of Railways Dzerzhinsky of the Bolshevik government ordered the repair of the bridge. The metallurgical plant of Bryansk joint-stock company [ru] (now Dneprovsky plant) in Dnipropetrovsk built a replacement section. The Kichkas Bridge reopened on 14 September 1921. On 19 October 1921, the Soviet Council of Labour and Defence (chaired by Lenin) awarded the Yekaterininsky railroad the Order of the Red Banner of the Ukrainian Soviet Socialist Republic for the early restoration of the Kichkas Bridge. At the beginning of 20th century, Zaporizhia was a small unremarkable rural town of the Russian Empire, which acquired industrial importance during the industrialization carried out by the Soviet government in the 1920-1930th In the 1929–1932 master plan for city construction was developed. At 10 km from the old town Alexandrovsk at the narrowest part of the Dnieper river was planned to build the hydroelectric power station, the most powerful in Europe at that time. Close to the station should be constructed the new modern city and a giant steel and aluminum plants. Later the station was named "DnieproHES", the steel plant – "Zaporizhstal'" (Zaporizhia Steel Plant), and the new part of the city – "Sotsgorod". (Socialist city) Production of the aluminum plant ("DAZ"- Dnieper Aluminium Plant) according to the plan should exceed the overall production of the aluminum all over Europe at that time. State Institute for Design of Metallurgical Plants(RU) (GIPROMEZ) developed a project of creation of the Dnieper Industrial Complex. GIPROMEZ consulted with various companies, including the Freyn Engineering Company of Chicago (USA), which participated in the design and construction of the blast furnaces. In the 1930s the American United Engineering and Foundry Company built a strip mill, which produced hot and cold rolling steel strip. This was a copy of the Ford River Rouge steel mill. Annual capacity of the mill reached 600,000 tons. Strip width was 66 inches. There was a second section that used a Soviet copy of the Demag AG strip mill that produced 45 inch wide strip steel. Between the hydroelectric dam and industrial area in 10 km from the center of the old Alexandrovsk was established residential district #6, which was named "Sotsgorod". In 20th doctrinaire idealistic enthusiasm of the architects was reflected in the intense debate about the habitation of the socialist community. The architects believed that by using new architectural forms they could create a new society. District #6 was one of the few implementations of urban development concepts. The construction of the district began in 1929 and finished in 1932. The main idea guiding the architects was the creation of the garden city, the city of the future. Multi-storey houses (not more than 4 floors) with large, roomy apartments were built in Sotsgorod with spacious yards planted with grass and trees around the buildings. Nikolai Kolli, V.A.Vesnin, G.M.Orlov, V.G.Lavrov and others designed the DniproHES and SotsGorod. Le Corbusier visited the town few times in the 1930s. The architects used the ideas of the constructivist architecture. The ring house the building #31 at Independent Ukraine Street (formerly - 40 years of Soviet Ukraine Street) was designed by V.G. Lavrov. Families of the Soviet and American engineers, advisers, and industry bosses lived in Sotsgorod at that time. However, the most of the workers during the construction of the hydro-power station and plants lived in dugouts at #15 and Aluminum districts. The south border of the Sotsgorog is limited by Verkhnya Ulitsa (Upper Street) and north border - by the hydroelectric power station. At the intersection between Sobornyi Avenue and Verkhnya Street, architect I.L. Kosliner set a tower with seven stories. This tower supposedly indicates the entrance gate of Sotsgorod from the south (from Alexandrovsk). Closer to the dam, the second tower was raised (architects I.L. Kosliner and L.Ya. Gershovich). Both towers point out a straight line of the central street of the district. The names of the streets have changed several times. The original name of Metallurgist Avenue was Enthusiasts Alley. This road leads to the factories. At that time, they believed that people going to the plant had only positive feelings like joy, pride, and enthusiasm. At the end of the road stands a 1963 sculpture of the metallurgist by sculptor Ivan Nosenko. During the German occupation, it was named Shevchenko Avenue. Later it was renamed Stalin Avenue; and after his death, it got present name of Metallurgist Avenue. Sobornyi Avenue originally had the name Libkhnet Avenue. "Forty Years of Soviet Ukraine" Street was once called Sovnarkomovska Street and during the German occupation Hitler Alley. District #6 is a small part of the global project called Big Zaporizhia. This project was designed for the city, to enable a half-million people to live in seven different areas: Voznesenka, Baburka, Kichkas, Alexandrovsk, Pavlo-Kichkas, Island Khortitsa, and (omitted). Each district must be independent of the others and yet part of а united city. The city line should be stretched along the banks of the Dnieper River for 22 km. The location of the Kichkas Bridge was in the flood zone upstream of the hydroelectric dam. Initially, it was planned to disassemble it and rebuild it in another location. But expert advice was that this was not cost-effective as it was cheaper to build a new bridge. The building of the hydroelectric dam meant that a new bridge was required to take the railway over the Dnieper. Instead of having a single bridge, as before, it was decided to take the railway over the island Khortytsia. The wide part of the river between Khortytsia and the city is known as the New Dnieper, and the narrower part between Khortytsia and the suburbs on the right bank of the river is known as the Old Dnieper. The New Dnieper was crossed by a three-arch two-tier bridge. Each of the arches spans 140 m. When the approach spans are included the total length is 715 m weighing 8,480 tons. The Old Dnieper was crossed by a single-span arch bridge with a total length of 370 m; the arch spans of 224 m and was then the largest single-span bridge in Europe. This bridge weighed 5,220 tons. Both bridges were designed by Professor Streletsky. They were made of riveted steel, and had two tiers: the upper tier for rail traffic and the lower tier for road traffic and pedestrians. They were assembled by a combination of Czechoslovakian and Soviet workers under the direction of a Soviet engineer named Konstantinov. The arches are steel made by the Vitkovetskom steel plant in Czechoslovakia, other steelwork was made at the Dnipropetrovsk Metallurgical Plant. The new bridges opened on 6 November 1931. The Kichkas Bridge was demolished afterwards. The war (World War II) between the USSR and Germany began on 22 June 1941. In the USSR this war was called the Great Patriotic War, 1941–1945. After the outbreak of the war, the Soviet government started the evacuation of the industrial equipment from the city to Siberia . The Soviet security forces NKVD shot political prisoners in the city. On 18 August 1941, elements of the German 1st Panzergruppe reached the outskirts of Zaporizhia on the right bank and seized the island Khortytsia. The Red Army blew a 120m x 10m hole in the Dnieper hydroelectric dam (DniproHES) at 16:00 on 18 August 1941, producing a flood wave that swept from Zaporizhia to Nikopol, killing local residents as well as soldiers from both sides. "Since no official death toll was released at the time, the estimated number of victims varies widely. Most historians put it at between 20,000 and 100,000, based on the number of people then living in the flooded areas". After two days, the city defenders received reinforcements, and held the left bank of the river for 45 days. During this time people dismantled heavy machinery, packed and loaded them on the railway platform, marked and accounted for with wiring diagrams. Zaporizhstal alone exported 9,600 railway cars with the equipment. Zaporizhia was taken on 3 October 1941. The German occupation of Zaporizhia lasted 2 years and 10 days. During this time the Germans shot over 35,000 people, and sent 58,000 people to Germany as forced labour. The Germans used forced labor (mostly POWs) to try to restore the Dnieper hydroelectric dam and the steelworks. Local citizens established an underground resistance organisation in spring 1942. The Krivoy Rog – Stalingrad and Moscow – Crimea railway lines through Zaporizhia were important supply lines for the Germans in 1942–43, but the big three-arch Dnieper railway bridge at Zaporizhia was blown up by the retreating Red Army on 18 August 1941, with further demolition work done during September 1941. and the Germans did not bring it back into operation until summer 1943. "As a result all goods had to be reloaded and tank-wagons carrying petrol could not go through to the front." When the Germans reformed Army Group South in February 1943, it had its headquarters in Zaporizhia. The loss of Kharkiv and other cities caused Adolf Hitler to fly to this headquarters on 17 February 1943, where he stayed until 19 February and met the army group commander Field Marshal Erich von Manstein, and was persuaded to allow Army Group South to fight a mobile defence that quickly led to much of the lost ground being recaptured by the Germans in the Third Battle of Kharkov. Hitler visited the headquarters in Zaporizhia again on 10 March 1943, where he was briefed by von Manstein and his air force counterpart Field Marshal Wolfram Freiherr von Richthofen. Hitler visited the headquarters at Zaporizhia for the last time on 8 September 1943. In mid-September 1943 the Army Group moved its headquarters from Zaporizhia to Kirovograd (now called Kropyvnytskyi). Both the big railway bridge over the New Dnieper and the smaller one over the Old Dnieper were damaged in an air raid by a group of eight Ilyushin Il-2s led by Lieutenant A Usmanov on 21 September 1943. In mid-August 1943, the Germans started building the Panther-Wotan defence line along the Dnieper from Kiev to Crimea, and retreated back to it in September 1943. The Germans held the city as a bridgehead over the Dnieper, with elements of 40th Panzer and 17th Corps. The Soviet Southwestern Front, commanded by Army General Rodion Malinovsky, attacked the city on 10 October 1943. Whilst the defenders held against the attacks, the Red Army reinforced its troops and launched a surprise night attack at 22:00 on 13 October, "laying down a barrage of shellfire bigger than anything... seen to date (it was here that entire 'divisions' of artillery appeared for the first time) and throwing in no fewer than ten divisions strongly supported by armour", the Red Army broke into the bridgehead forcing the Germans to abandon it on 14 October. The retreating Germans destroyed the Zaporizhstal steel plant almost completely; they demolished the big railway bridge again, and demolished the turbine building and damaged 32 of the 49 bays of the Dnieper hydro-electric dam. The city has a street between Voznesenskyi and Oleksandrivskyi Districts and a memorial in Oleksandrivskyi District dedicated to Red Army Lieutenant Yatsenko(RU) who commanded the tank, which first entered the city; he and his crew were killed in the battle for the city. The Red Army did not recapture the parts of the city on the right bank until 1944. The rebuilding of the Dnieper hydro-electric dam commenced on 7 July 1944; the first electricity was produced from the restored dam on 3 March 1947. The automobile transport connection between the right shore city districts and city centre via the Preobrazhensky bridge was already congested in the late nineties. In 2004, construction began on new bridges across the Dnieper. These bridges are parallel to the existing Preobrazhensky bridge at a short distance downstream. Construction of the bridges halted soon after it began, and remain untouched due to lack of funding. The project design is dated and needs revising, and the cost of the bridge is estimated to reach 8 billion hryvnias (as opposed to the original 2 billion). During the 2014 Euromaidan regional state administration occupations protests against President Viktor Yanukovych were also held in Zaporizhia. On 23 February 2014 Zaporizhia's regional state administration building was occupied by 4,500 protesters, Mid-April 2014 there were clashes between Ukrainian activists and pro-Russians. The Ukrainian activists outnumbered the pro-Russian protesters. In the year of the fall of the Russian Empire (1917), the population of Alexandrovsk was about 60,000 people. In the year of the fall of the Soviet Union (1992), the city's population reached almost 1 million people. In 70 years, a small rural town turned into a large industrial, cultural and scientific center. In other words, the modern city was created in times of socialism and as a result, after 19.05.2016, when the Ukrainian parliament issued Law No. 275, which Ukrainians briefly called as the "Decommunization Law", the city council is forced to rename more than 50 main streets and the names of the administrative parts of the city, the monuments of the Soviet Union leaders (Lenin, Felix Dzerzhinsky) were destroyed. The names in honor of the others the Soviet leaders in the titles of the plants, factories, culture centers DniproHES were also removed. The city is located in south-eastern Ukraine. The Dnieper river splits the city for two parts between them is located the Khortytsia island. The city covers 334 km2 at an elevation of 50 m above sea level. Two streams around Khortytsia island are called the New and Old Dnieper. The New Dnieper is about 800 m (2600 feet) wide and the Old Dnieper is about 200 m (650 feet). The island has 12 km × 2 km (7.5 mi × 1.2 mi) sizes. There are also several small rivers in the city, which enter the Dnieper: Sukha and Mokra Moskovka, Kushuhum, and Verkhnia Khortytsia. Zaporizhia is a regional seat of Zaporizhia Oblast and a city of regional significance meaning that it has a form of self-rule within the oblast (region). The city is divided into 7 administrative raions. The city population has been permanently declined since the first years of the state independence. In 2014-2015 the rate of the population decrease was -0.56%/year. Zaporizhia residents speak mostly in Russian in the city itself but in the peripheral towns and villages Ukrainian language is dominant. [not in citation given] For official government business Ukrainian is used. Most of the citizens are Orthodox Christians of canonical Ukrainian Orthodox Church (Moscow Patriarchate) or non-canonical self-proclaimed Kiev Patriarchate. Among of the Orthodox churches the Church of the Intercession, which is under the Moscow Patriarchate, is most popular. There are also St. Nicholas Church and St. Andrew's Cathedral in the city. Orthodox Judaism is represented by one union and six communities. In the Zaporizhia district there are five communities which are part of the Spiritual Administration of Muslims of Ukraine and four independent Muslim communities. The city hosts a branch of the Vedic Academy. Zaporizhia is an important industrial center of Ukraine, the country's main car manufacturing company, the Motor-Sich world-famous aircraft engine manufacturer. Well supplied with electricity, Zaporizhia forms, together with the adjoining Donets Basin and the Nikopol manganese and Kryvyy Rih iron mines, one of Ukraine's leading industrial complexes. The city is also a home of the Ukraine's main automobile production center which is based at the Zaporizhia Automobile Factory ZAZ producing such Ukrainian car brands like Zaporozhets and Tavria. After the end of the Russian Revolution, the city became an important industrial center. The presence of cheap labor and the proximity of deposits of coal, iron ore, and manganese created favorable conditions for large-scale enterprises of the iron and mechanical engineering industries. 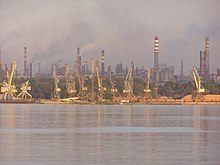 Today Zaporizhia is an important industrial center of the region with heavy industry (particularly metallurgy), aluminium, and chemical industry. In the city cars, avia motors, radioelectronics are manufactured. The port of Zaporizhia is an important place of transshipment for goods from the Donbas. Zaporizhstal, Ukraine's fourth largest steel maker, ranks 54th in the world and is based in the city. Zaporizhia is a large electricity generating hub. There are hydroelectric power plant known as "DniproHES" Dnieper Hydroelectric Station and the largest in Europe nuclear power plant. Zaporizhia plants generate about 25% of the whole Ukrainian electricity consumption. The Zaporizhia Nuclear Power Plant is located near the Enerhodar ( Energy gifter), around 60 km from Zaporizhia. Also, there is the biggest thermal power station in Ukraine. 'Fountain of Life' in Zaporizhia (built in 2004) with the daily exhibition of Zaporizhian artists. There are a number of small amateur groups of folk music bands, art galleries in Zaporizhia. The city regularly holds festivals and feasts, competitions of the Cossack martial arts and art exhibitions. Zaporizhia has an open-air exhibition-and-sale of Zaporizhia city association of artists «Kolorit» near the 'Fountain of Life' at the Mayakovskoho square. A daily exhibition of artists' organizations of the city is a unique place in Zaporizhia, where people can communicate with craftsmen and artists, watch classes of carving, embroidery, beading and other creative works, receive lessons from professional artists, designers, and cartoonists. The 12 km (7.5 mi) x 2 km (1.2 mi) island Khortytsia is located in the geographical center of the city. The city embraces the island by banks of the New and Old Dnieper streams. Two concrete bridges connect the Island to the city. They have been designed and constructed by the engineer Boris N. Preobrazhensky in 1952. Two level bridges have height about 54 meters. High level of the bridges is intended for rail and bottom – for cars and pedestrians. The historical and cultural museum "Zaporizhian Sich" is placed on the northern rocky part of the island Khotritsa. The museum is the reconstructed stronghold of the Zaporizhian Cossacks. All features of the military cossack's camp life and their lifestyle are presented in the museum. The smaller islands are located between the dam and the island Khortytsia. Each of these islands has its own legend. On one of them named Durnya Scala (Rock of the Fool) Tzar Peter the Great punished the Cossacks by flogging for their betrayal on the side of Charles XII of Sweden during the Great Northern War between Russia and Sweden. The panoramic view of the DnieproHES from Khortytsia island is very impressive. The straight and long Sobornyi avenue (10 km) ends in the SotsGorod near the Dam, which built up of the constructivist architecture of the 20th century. The city of Zaporizhia is an important transportation hub in Ukraine and has deeply developed transportation system that includes roadway, rail, river and air options for passenger, freight as well as public utilities transit. Public city transport includes buses, minivans, trams, trolleybuses and railways. On the eastern outskirts of Zaporizhia passes a major national highway M-18 that connects Kharkiv with Simferopol. Three other national highways terminate in Zaporizhia, one H-23 which starts in Kropyvnytskyi and through Kryvyi Rih ends in Zaporizhia; the second H-08 which starts in Kiev and travels along Dnieper all the way south passing through number of important cities such as Kremenchuk, Kamianske, Dnipro, and others; and the other highway H-15 which arrives to Zaporizhia from Donetsk. There are four road bridges over Dnieper and two rail bridges. All bridges but one connect the city with Khortytsia island. The other bridge goes over the river dam of DniproHES. The Zaporizhia city has two railway stations, Zaporizhia-the-First and Zaporizhia-the-Second. The First is the central station. It is located in the southern part of the city and is a part of the "north-south" transit route Simferopol-Kharkiv. The line of the Zaporizhia-the-Second station connects the Donbas coalfield with Kryvyi Rih iron ore site. The city's two river ports are part of the national water transportation infrastructure that connects Kiev to Kherson along Dnieper river and utilizes some freight ships as well as cutter boats to travel between Zaporizhia and nearby villages. The large island of Khortytsia splits the Dnieper into two branches (channels) the main branch that passes the island on its eastern side and the alternative branch also known as Staryi Dnipro (Old Dnieper) that flows past the island on its western side. The city's sole airport that is located to the east of the city (left-bank of Dnieper) includes both domestic and international flights. To the west of the city (right-bank of Dnieper) is located smaller airfield Shyroke. Zaporizhia is an important setting in two Axis victory in World War II short fictions by Harry Turtledove: "Ready for the Fatherland" (1991) and "The Phantom Tolbukhin" (1998). Turtledove always uses the Zaporozhye spelling. In addition, in 1969 the city renamed one of its streets "Wrocław", the Wrocław communist government acknowledging that they should honour the Ukrainian city in a similar way and a part of the Sudecka – Grabiszyńska street towards the square of the Silesian Insurgents – was renamed to Zaporoska street. It is about 1.3 km long. ^ Віталій Бондар, Ірина Козлова. (25 September 2010). Таємниці унікальних документів (in Ukrainian). Запорізька правда. ^ a b c d e f Natalia Ostasheva Venger (2003). "The Mennonite Industrial Dynasties in Alexandrovsk". Journal of Mennonite Studies. V21. Dnepropetrovsk National University. pp. 89–110. ^ Friesen, R. Building on the Past: Mennonite Architecture, Landscape and Settlements in Russia/Ukraine. Raduga Publications, 2004. ^ "Советская архитектура". Искусство. 27 October 1969 – via Google Books. ^ a b The Soviet economy and the Red Army, 1930—1945, by Walter Scott Dunn, Greenwood Publishing Group, 1995 ISBN 978-0-275-94893-1, page 13. ^ "Колли Николай Джемсович". bse.sci-lib.com. ^ Germany and the Second World War, Volume IV The Attack on the Soviet Union, by Horst Boog, Jürgen Förster, Joachim Hoffmann, Ernst Klink, Rolf-Dieter Müller, Gerd R. Ueberschär, pub Clarendon Press, 1998, ISBN 0-19-822886-4, p 909. ^ "The Eastern Front, Timeline 1941". Archived from the original on 19 July 2011. Retrieved 18 April 2011. ^ Radio Free Europe Radio Liberty, Ukrainian Activists Draw Attention To Little-Known WWII Tragedy , by Dmytro Moroz and Claire Bigg, 23 August 2013. ^ Germany and the Second World War, Volume IV The Attack on the Soviet Union, p 607 says that Zaporizhia was captured on 1 October 1941. ^ a b Lost Victories, by Field Marshal Eric von Manstein, pdf version p263. ^ a b c d Lost Victories, by Field Marshal Eric von Manstein, says that the Germans finished repairing the railway bridge only a few months before they lost the city in October 1943. ^ Germany and the Second World War, Volume VI The Global War, by Horst Boog, Werner Rahn, Reinhard Stumpf, and Bernd Wegner, pub Clarendon Press, 2001, ISBN 0-19-822888-0, p 1184–1193. ^ Lost Victories, by Field Marshal Eric von Manstein, translated by Anthony G Powell, pdf version p267-270. ^ Lost Victories, by Field Marshal Eric von Manstein, pdf version p 274. Special collections->Image archive->Start search->Freie suche-> type Manstein ->click "Suchen" -get results-> Look at photos 28–43. The German Federal Archive has one of these photos, but recorded under the date 18 March 1943. ^ Lost Victories, by Field Marshal Eric von Manstein, pdf version p290-2. ^ a b "The Eastern Front, Timeline 1943". Archived from the original on 19 July 2011. Retrieved 18 April 2011. ^ Moscow-Stalingrad-Berlin-Prague, Memories of Army Commander ("Москва-Сталінград-Берлін-Прага". Записки командарма), by Dmitri Danilovich Lelyushenko (Лелюшенко Дмитро Данилович), pub Nauka, Moscow, 1987, chapter 4. ^ "В Запорожье участники Майдана опечатали кабинеты руководства Запорожской ОГА : Новости УНИАН". Ukrainian Independent Information Agency. Retrieved 24 February 2014. ^ "Armed, pro-Russian separatists lay siege to Donetsk Oblast; at least three dead (VIDEOS, UPDATES) - Apr. 14, 2014". 14 April 2014. ^ "Паспорт города Запорожье". photoalbum.zp.ua. ^ "The interactive map of island of Khortitsa (Russian)". Archived from the original on 2 July 2011. Retrieved 2 July 2011. ^ "ПОГОДА в Запорожье" (in Russian). Погода и климат. Retrieved 3 August 2016. . Snow days have been taken to mean days on which it snowed, not days with snow cover on the ground. ^ "Zaporizhia · Population". population.city. ^ Ripley, George; Dana, Charles A. (Charles Anderson) (27 October 1879). "The American cyclopaedia: a popular dictionary of general knowledge. Edited by George Ripley and Charles A. Dana". New York D. Appleton – via Internet Archive. ^ a b Ukrainian SSR (Украинская ССР), pub Economic Institute of the Ukrainian Academy of Sciences, 1958, p87. ^ Sergina V. "City Z:1921-199", film "Year 1926" Сергина В. Город Z: 1921–1991 (Невыдуманные истории): Исторически–познавательный ТВ проект для любой зрительской аудитории. – К., 2005.- 1 компакт – диск. Фильм "Год 1926"
^ Economic geography of the USSR by S S Balźak, V F Vasyutin, Ya G Feigin, pub Macmillan, 1956. ^ a b The emergency evacuation of cities: a cross-national historical and geographical study, by Wilbur Zelinsky, Leszek A. Kosiński, pub Rowman & Littlefield, 1991, ISBN 978-0-8476-7673-6. ^ Sergina V. "City Z:1921-199", film "Year 1942" (Сергина В. Город Z: 1921–1991 (Невыдуманные истории): Исторически–познавательный ТВ проект для любой зрительской аудитории. – К., 2005.- 1 компакт – диск. Фильм "Год 1942") said the population for 1942 was 103,400. ^ The Ukrainian quarterly, Volumes 26–27, pub Ukrainian Congress Committee of America, 1970, p223. ^ Rand McNally atlas of world geography, pub Rand McNally Company, 1996, p38. ^ Лозовой Н. (17 January 2011). "Этнические войны: украинская версия". Истеблишмент. Archived from the original on 23 August 2011. ^ a b c d e f g h i Міста-побратими м. Запоріжжя [Twin Cities Zaporizhia]. City of Zaporizhia (in Ukrainian). Шановні відвідувачі і користувачі сайту. Archived from the original on 3 August 2012. Retrieved 2013-08-07. ^ Беляева Л. Города-побратимы Запорожья // Правда. – 2011. – № 16. – С. 9. ^ "Belfort – Les Relations Internationales" [Belfort – International Relations]. Belfort Mairie (in French). Archived from the original on 20 July 2011. Retrieved 2013-12-21. ^ Zachert, Uwe; Annica Kunz. "Twin cities". Landeshauptstadt Magdeburg [City of Magdeburg]. Archived from the original on 1 September 2012. Retrieved 2013-08-07. ^ "Wrocław, ul. Zaporoska – Dolny.Slask.org.pl". Archived from the original on 29 September 2011. Retrieved 29 July 2011. Е. М. Поспелов (Ye. M. Pospelov). "Имена городов: вчера и сегодня (1917–1992). Топонимический словарь." (City Names: Yesterday and Today (1917–1992). Toponymic Dictionary." Москва, "Русские словари", 1993. Wikimedia Commons has media related to Zaporizhia. Look up zaporizhia in Wiktionary, the free dictionary. One of the few external reports on the city in English is the BBC report "Ukraine: Why the Orange Revolution ran out of steam", Daniel Sandford, Moscow correspondent, BBC News 10 March 2011. This page was last edited on 11 April 2019, at 16:50 (UTC).